Looks and feels great! Very functional and durable. Recommend! 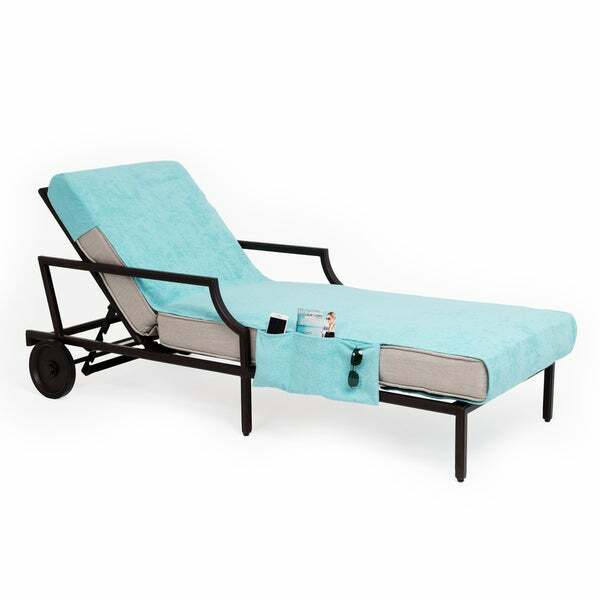 This luxury Turkish cotton fitted lounge chair cover is in a beautiful aqua green color and features a convenient side pocket to hold your belongings. The custom fit, stay in place towel lounge cover offers lounging comfort while providing superb personal hygiene for your days in the sun. This chair cover is soft and washes very nicely. It is a nice terry material and is sturdy. The color is nice, not too bright. The pockets are convenient. The only change I would make is that it cover the metal arms of chair which get very hot in the sun. The material is great but it's too big for my lounge chairs. Very soft, easily washable! Pretty color for by the lake. It covered the lounge that I use every weekend in the summer very well, and did not come lose when laying down or getting up. Perfect to use over my chaise cushion to protect it from body oils. The side pocket is an extra bonus. Very nice towel. Extremely long so your chair is fully covered. Just wish it was a tad bit thicker and had pockets on both sides. I thought purchasing an authentic Turksih Cotton Towel Cover would mean a very thick and soft, high quality product. It is the complete opposite. The material is very thin, a stiff feeling. The quality of the sewing is bad. Threads were hanging off of it. I was totally disappointed but too lazy to send it back. The quality and color are great and I love the pockets. I gave it 4 stars because it is a bit wide and doesn't fit snugly over the chair. Very soft, thick, and a beautiful ocean blue. Love it!